I recently posted that I’m working through The Artist’s Way with a group of artists from various mediums. For those who aren’t familiar with it, the book helps people remove blocks to their creativity. Blocks can prevent someone from doing creative work or they can prevent an already prolific artist from making art that connects to their most genuine self. I use the tools in the book to get help with both kinds. Play more, as in the childhood idea of play. Morning Pages, which are the three pages of stream-of-consciousness brain drivel you dump into a journal every morning. I’ve been doing these things for almost 10 years now, and they’re more consistent than most things in my life. They help me translate my worries, anger, jealousy, and frustration into do-able, manageable actions. When I don't do them, it's hard to hear through the jabber to the more important and enjoyable things I could be doing that day. Reading the week's chapter and doing the assigned tasks every week. The tasks in particular are super helpful, plus I have a genuine love for anything that involves reading and writing. I also love organization, goal-setting, and time-management stuff, so those things always get a big jolt of action when I work through the tasks. I’m also fascinated by the “why” of behavior, and the tasks help me answer that question about myself. I’ll never tire of self-analyzation. Thankfully, there’s plenty of “so now what?” exercises to help me develop a new behavior once I get to the bottom of an old one. The weekly Artist Date, which is playtime with your inner child. I don’t think I went on a single one the first time I did the book. I didn’t do much better the second and third reading, either. Historically, I haven't been very good at playtime. As a kid, I dreaded recess, PE, role play, etc. I get a little better at incorporating more Artist Dates each time, but they’re still a struggle. You’d think the thing that’s supposed to be the most fun would be the easiest to include, but, for various reasons, it hasn't been. I’ve made a lot of progress since my first reading of the book in grad school almost 10 years ago. Tasks that were really difficult before are much easier now. I’ve incorporated a lot of activities into my life to the point that I'm finding I've already done some tasks before knowing they were assigned for the week. Also, Cameron’s regular encouragement is now more like a pleasant reminder than a life-changing revelation. There’s almost always an irrational, imperfect something-or-other in someone else’s art that seems to attract me to it. This is freeing me to not only be illogical sometimes, but to not freak out when something’s not perfect. I can like or want stuff without always having to analyze or critique or defend it. Sometimes I don’t like a piece of art despite it having all of the “right” elements. This reminds me that people will have a gut reaction to my art no matter how “right” or “good” it is. Some will like it. Some won’t. It’s not always about perfection. Sometimes it's about imperfection. I can and should be willing to be childlike and make mistakes and look silly at any age. It is the only way I can get better at things that I’m not very good at. This is one of the roots of my issues with play and fun. I want to write a lot more. As soon that thought peeked through, there were a bajillion memories that flooded in and made me realize, “Of course I want to write!” But it hadn’t really occurred to me that it was something I needed to unblock until this time through the book. I'm not ready to say, "I want to be a writer," but I know I want the process to be a bigger part of my life. I’m writing a lot more. I identified wasteful spending of time and money and cut back on both. I’ve spent some of that previously mis-spent money on inexpensive luxuries that are good for my body and my soul. I’m taking care of my body more. I’ve unearthed projects that went dormant. I’ve thought of new projects. Most importantly, I’ve taken steps to get those old and new projects moving. Calls have been made. Emails sent. Practice time increased. Compositions are emerging. Gigs scheduled. Singing or playing or composing involves more smiling and dancing and laughing lately. Mistakes are less embarrassing and paralyzing. My partner and I have learned new ways to separate the wheat from the chaff in terms of our time and resources, both together and apart. We’re getting more done, spending more time together, and having more fun. As I re-read all of that, it seems like a ridiculous amount of good stuff that can come out of one book in such a short time, but it’s all true. This is why I’m doing it for the 4th time. If you’re curious, check out what people have highlighted from the book through Kindle. 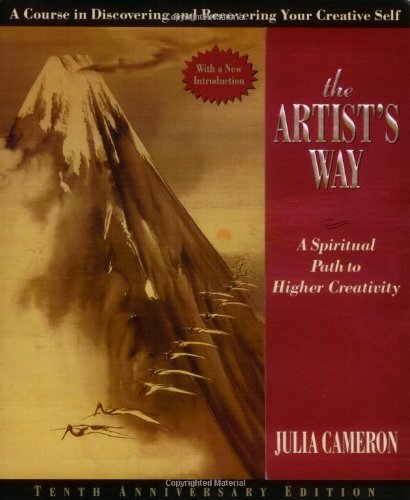 Have you read The Artist’s Way? What did you think? Leave some thoughts in the comments. Newer PostHate practicing? You're not alone.